Having over time developed more than a passing interest in astronomy and astrophysics (as you do), I’ve recently joined the Bristol Astronomical Society. One of the many great things about the society is its small observatory in a field just outside Bristol. And last weekend, we hosted a horde of local schoolchildren and their parents for an evening of observation… and an introduction to the wonders of the universe. It was light when we started, so we had a couple of solar telescopes (fitted with special filters to protect the eyes) that allowed people to see sunspots and solar prominences. 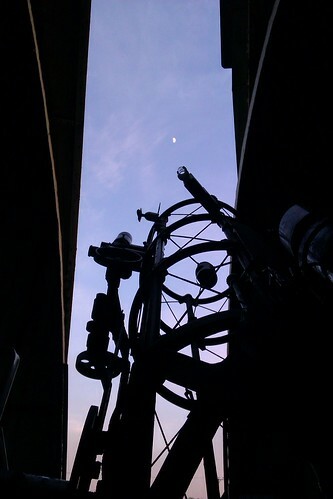 And in the dome, we had the 12″ Cyril Swindin telescope pointed at the moon, which looked great even in the daylight. Here’s a view from the dome, with the moon in the distance. And yes, the telescope is exceedingly cool. As it got dark, we replaced the solar telescopes with some regular ones and all attention turned to the planets. First up was Venus, followed closely by Jupiter with its moons. We then swung across the sky to have a look at Saturn, with its rings clearly visible. The reception from the kids (and their parents) was great. And, to be honest, I had quite a lot of fun, too. This entry was posted in Astronomy, Photography and tagged Astronomy, Bristol, Photography, Telescopes by Simon Perks. Bookmark the permalink.